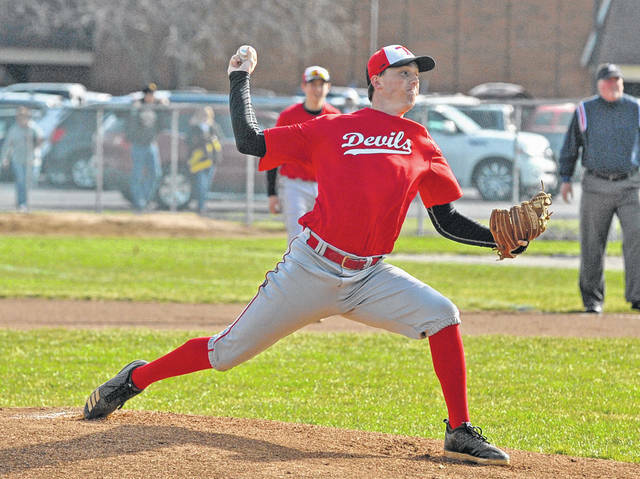 Josh Brown|Miami Valley Today Tippecanoe’s Kenten Egbert pitches Monday against Sidney. Josh Brown|Miami Valley Today Tippecanoe’s Nolan Mader hits an RBI single in the first inning Monday against Sidney. Josh Brown|Miami Valley Today Tippecanoe’s Cade Beam rounds third base and scores Monday against Sidney. Josh Brown|Miami Valley Today Tippecanoe first baseman Matt Salmon tags out a Sidney runner on a pickoff play Monday. 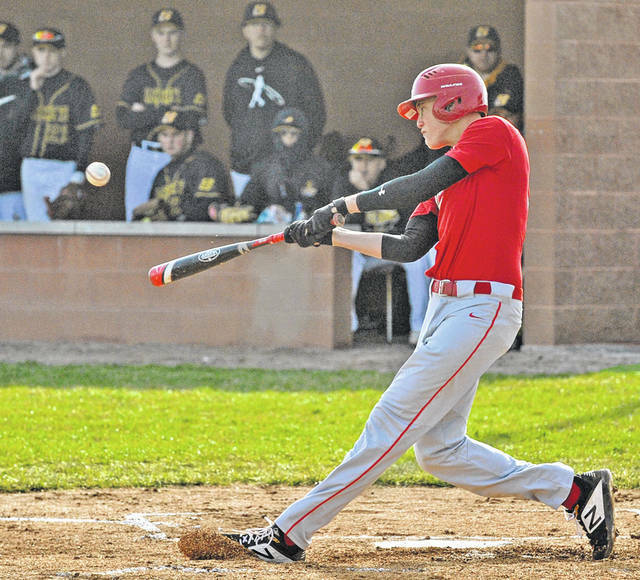 Josh Brown|Miami Valley Today Tippecanoe’s Eli Hadden makes contact Monday against Sidney. 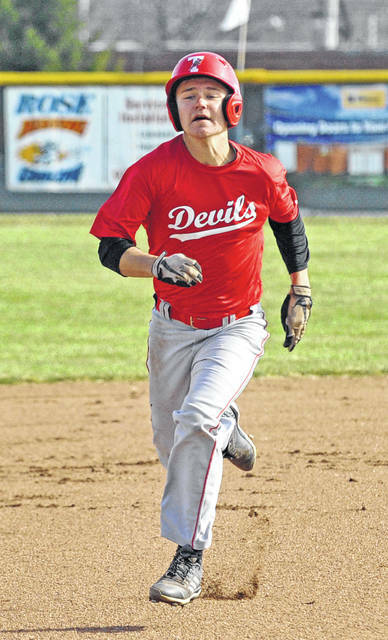 Josh Brown|Miami Valley Today Tippecanoe’s Jack Cleckner runs the bases Monday against Sidney. Josh Brown|Miami Valley Today Tippecanoe third baseman Nolan Mader makes a stop Monday against Sidney. Egbert simply had everything working. Tippecanoe (3-3, 1-0 GWOC American North Division) began the season with five tough games in Florida last week, going 2-3 on the trip. Egbert pitched in one of those games, a loss to New Albany. For Sidney (2-2, 1-1 GWOC American North), the only two hits didn’t make it out of the infield — Rose beat out a slow-rolling infield single in the first inning and Ryan Cagle beat out a sharp grounder to third with two outs in the second. From there, Egbert retired the next 16 straight, striking out six straight at one point and striking out the side three times in total — including in the seventh to wrap things up after only an hour and a half. It’s something Tippecanoe’s opposition — and the Devils’ own defense — may have to get used to this season, with the Devils boasting a pair of Division I college commits in their rotations. Egbert is going to Miami University (Ohio) and Ian Yunker is committed to Morehead State. Offensively, the Devils got the job done enough but still left plenty of chances on the table. Jack Cleckner drew a one-out walk in the first inning, stole second and took third on a wild pitch, then Cade Beam drew a walk to put runners on the corners. Nolan Mader and Egbert then hit back-to-back RBI singles to left that put the Devils up 2-0 on Sidney starter Mitch Larger. Yunker then beat out an infield single in the hole at short to load the bases, still with one out, but Larger got a popout and a forceout to minimize the damage. Tippecanoe put two runners on in the second, but a lineout to Ben Spangler at short turned into an inning-ending double play. And in the third, Tippecanoe loaded the bases with out out again after a single by Egbert, a walk by Yunker and an infield single by Matt Salmon, then Eli Hadden drew an RBI walk to make it a three-run game. But a bunt right back to the pitcher turned into a one-two-three double play to keep the score 3-0, and all Larger allowed from that point on was another walk to Beam and a pinch-hit single by Jonathan Baileys. And even though Tippecanoe’s offense did enough to win with Egbert pitching the shutout, Cahill knows that they’ll need to do a bit more to contend for another GWOC American North title. After traveling to Sidney Tuesday to finish the division series, Tippecanoe returns home Thursday to host Xenia in an American League crossover matchup. FLORENCE, KY — After defeating Cross County Conference rival Bethel in a conference matchup on Thursday, the Newton baseball team took on the Bees once more in a doubleheader Sunday at Florence Freedom Stadium in Florence, Ky., with the Indians earning a sweep on the day with 3-2 and 10-6 victories. In the first game, Newton (5-0) took a 3-0 lead after three innings and held off a late charge by Bethel (0-4). Ross Ferrell pitched a complete game for the win, striking out 10 and giving up two runs, one earned, on six hits and four walks. The Indians, meanwhile, scored two of their runs on wild pitches and the other on an error, being outhit 6-4 in the game. Caleb Garber was 2 for 3, Alex Koon and Cameron Caldwell each had a hit and scored a run and Charlie Walker scored a run. Dylan Williams doubled and had an RBI for Bethel, Braden Hennagir was 2 for 4 with a run scored and Laybe McClure scored a run. Spencer Briggs took the loss, striking out two, walking two and giving up three runs, two earned, on four hits. There was a bit more offense in the second game, especially for the Indians. Ryan Mollette was 2 for 4 with a home run, two RBIs and three runs scored, Nate Zielinski was 2 for 3 with a triple and two RBIs, Charlie Walker was 2 for 3 with an RBI, Cameron Caldwell was 2 for 4 with two runs scored, Mitchell Montgomery had two RBIs and Patrick Hughes had a double and two runs scored. Walker also got the win on the mound, going four innings and striking out four while giving up five runs, four earned, on seven hits. Zielinski pitched the final three innings, striking out four and giving up one unearned run on one hit. For Bethel, which actually led 5-1 going into the bottom of the fourth, Williams was 2 for 4 with a double and two RBIs, Rylan Dilbeck was 2 for 4 with an RBI and two runs scored and Hennagir was 2 for 3 with two RBIs. Justin Pantall took the loss in relief of Patrick Swinderman as Newton scored four in the fourth to tie the score then, after Bethel retook a 6-5 lead in the top of the fifth, added four more in the bottom of the fifth to take control for good. https://www.tdn-net.com/wp-content/uploads/sites/21/2019/04/web1_040119jb_tipp_egbert.jpgJosh Brown|Miami Valley Today Tippecanoe’s Kenten Egbert pitches Monday against Sidney. 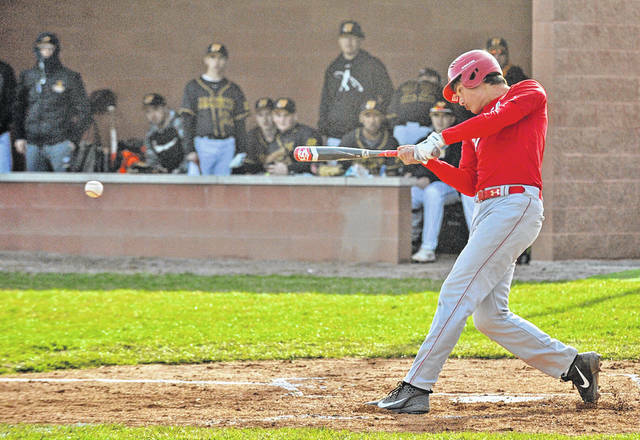 https://www.tdn-net.com/wp-content/uploads/sites/21/2019/04/web1_040119jb_tipp_nolanmader.jpgJosh Brown|Miami Valley Today Tippecanoe’s Nolan Mader hits an RBI single in the first inning Monday against Sidney. https://www.tdn-net.com/wp-content/uploads/sites/21/2019/04/web1_040119jb_tipp_cadebeam.jpgJosh Brown|Miami Valley Today Tippecanoe’s Cade Beam rounds third base and scores Monday against Sidney. 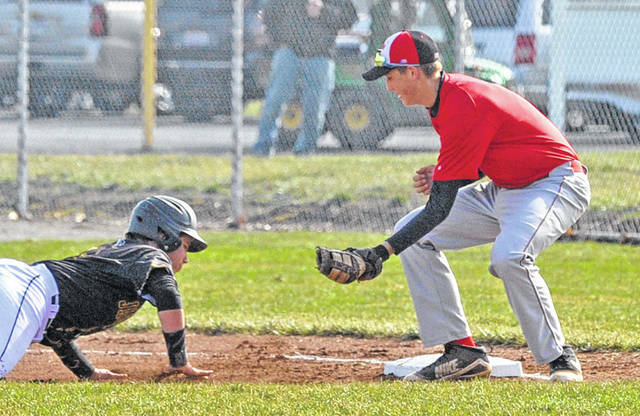 https://www.tdn-net.com/wp-content/uploads/sites/21/2019/04/web1_040119jb_tipp_mattsalmon.jpgJosh Brown|Miami Valley Today Tippecanoe first baseman Matt Salmon tags out a Sidney runner on a pickoff play Monday. https://www.tdn-net.com/wp-content/uploads/sites/21/2019/04/web1_040119jb_tipp_elihadden.jpgJosh Brown|Miami Valley Today Tippecanoe’s Eli Hadden makes contact Monday against Sidney. 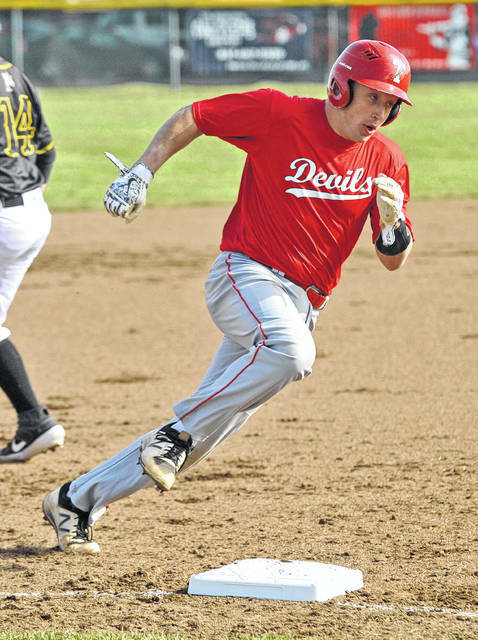 https://www.tdn-net.com/wp-content/uploads/sites/21/2019/04/web1_040119jb_tipp_jackcleckner.jpgJosh Brown|Miami Valley Today Tippecanoe’s Jack Cleckner runs the bases Monday against Sidney. 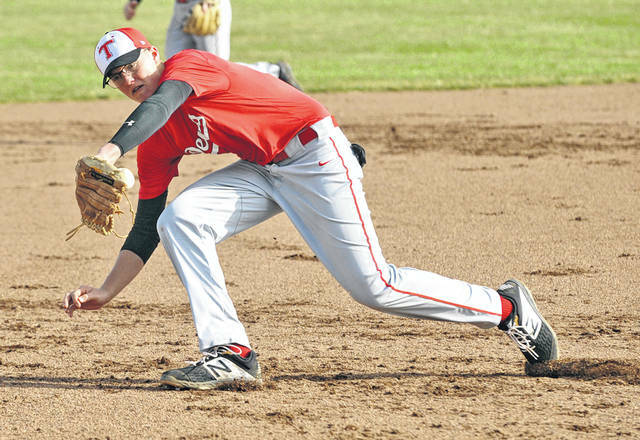 https://www.tdn-net.com/wp-content/uploads/sites/21/2019/04/web1_040119jb_tipp_nolanmader_field.jpgJosh Brown|Miami Valley Today Tippecanoe third baseman Nolan Mader makes a stop Monday against Sidney.